Tributes are pouring in for former New Zealand coach Sir Fred Allen who has died at the age of 92. 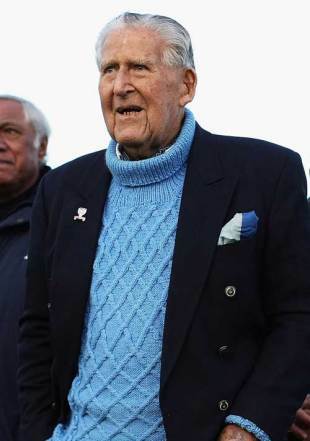 Allen, who coached the All Blacks from 1966 until 1968 and was known as The Needle, had been battling ill health for some time and was in full-time care. A fly-half, he played 21 matches for the All Blacks between 1946 and 1949 and captained the side in all of them - but it was as a coach he made a major impression. During his spell in charge of New Zealand, one of the team's greatest eras, all 14 Tests matches played were won. He was knighted in 2010 and had been inducted into the New Zealand and International Rugby Halls of Fame. A family statement read: "Sir Fred passed away peacefully in the early hours of the morning at Maygrove Village Hospital, Orewa, where he has resided in recent months. His record as a player and coach of the Auckland rugby team and as a player, captain, selector and coach of the All Blacks has been well documented. He was forthright and inspirational and his services to Auckland Rugby and many other sporting and non-sporting organisations reflected his ever present passion and generosity of spirit. "Earlier this week, Sir Fred had participated in the opening of a bridge at Auckland Memorial Park and at an Anzac Day service." New Zealand Rugby Union chairman Mike Eagle paid tribute to the former coach saying: "Sir Fred is one of the most treasured legends in rugby. He represented a great era of success for the All Blacks both as a player and as an unbeaten coach during his tenure. His unfailing dedication to rugby and his continuing contribution to the game, well after his own playing and coaching days, secures his place in our history books as one of the great legends of the game." Current All Blacks boss Steve Hansen also expressed his sadness at Allen's death. "Sir Fred's achievements as a player and coach were legendary," Hansen said. "In his later years he was a great guy to talk footy with and still took a keen interest in how the team was going." Allen's wife Norma died in 2009. He is survived by his daughter Marianne and granddaughters Inés and Katia.